» Articles » Flowers » Impatiens: Good With Lemonade! Okay, don’t be ashamed to admit it—you want to achieve great gardening results with a minimum of backbreaking effort! Hey, I’m with you, and here’s a great little friend we’re all gonna’ love—impatiens. These wonderful annuals give you ridiculous numbers of blossoms all season long with almost no expectations of coddling and cooing on your part. Just plant them, pull up your lawn chair, and enjoy the show! Hate tilling and toiling under the blazing sun? Then don’t do it—these kindly little showoffs do their thing in the shade. In fact, that’s where they are happiest and most prolific. Too much direct sunlight on your impatiens will result in stunted stems, wilted foliage, and blooms that are small both in size and number. Filtered sunlight and partial shade are perfect, making impatiens the ideal choice for summer blooming annuals in areas of your garden that just don’t get enough sunlight to satisfy your petunias, marigolds, and other sun-loving pals. Try mixing impatiens in with hosta plants or other greenery under overarching shade trees for a nice effect. Clusters of impatiens overflowing your hanging baskets and container plantings on the patio and porch add much color to your outdoor social gathering areas throughout the warm summer months. 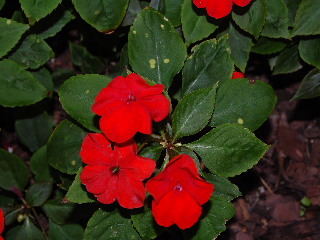 Speaking of colors, impatiens are available in a wide variety of—including pink, purple, orange, blue, red, and white. And while your impatiens don’t like a lot of bright sunlight, what they DO like is a loose, moist, organic soil. Allowing your impatiens to sit in dried out soil is just as harmful to their happiness and well being as sitting in the bright sun. You can start your impatiens from seed (seems like a lot of work to me!) and then transplant the seedlings into your garden. Or just buy the plants at your garden center in the spring when it’s time to set them into the ground. 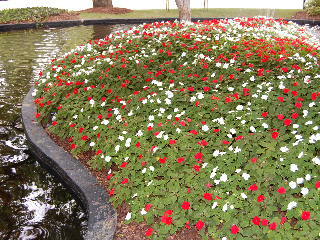 As you set your impatiens in place, work some slow release fertilizer into the soil, water well, and add mulch. Not too difficult, huh? Impatiens planted into a loose, moist soil in a shady area produce colorful blossoms all summer long! If that’s too much for you, maybe we both should just move back over there onto the porch and have another glass of lemonade. Next time we get together, we’ll debate the merits of drinking lemonade through a straw as opposed to sipping it straight from the glass.